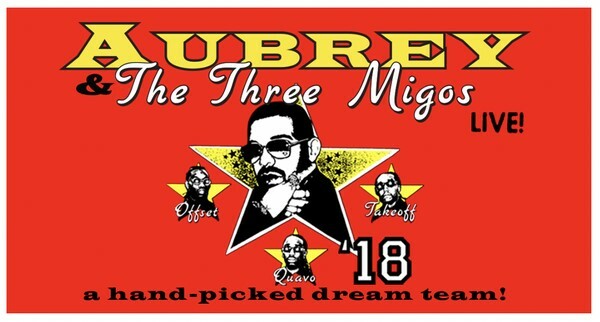 LOS ANGELES, CA (Sept 17, 2018) – Due to overwhelming fan demand, platinum selling artist Drake is adding a seventh show in Los Angeles on Saturday, October 20th at the “Fabulous” Forum and a third show in Atlanta on November 18th to the ‘Aubrey and The Three Migos Tour. In addition, Drake announced the rescheduled date for his previously postponed St. Paul show will take place on Sunday, November 11th. All tickets purchased for the original date will be honored. Produced by Live Nation, the North American outing also features special guests and “Walk It Talk It” collaborators Migos. The full routing can be found below. The tour follows a stellar summer for Drake, including the release of his hit singles “God’s Plan” and “Nice For What,” and the release of his fifth number one studio album Scorpion. American Express® Card Members can purchase tickets for the newly added dates before the general public beginning Tuesday, September 18th at 10am local time through Thursday, September 20th at 10pm local time. Tickets for the new dates will go on sale to the general public this Friday, September 21st at Ticketmaster.com starting at 10am local time.